Yesterday was a long day. Not a bad day, mind you, just long. So, when I encountered a beautiful brown box on my front step at the house, I was extraordinarily pleased! My new knitting toys arrived! 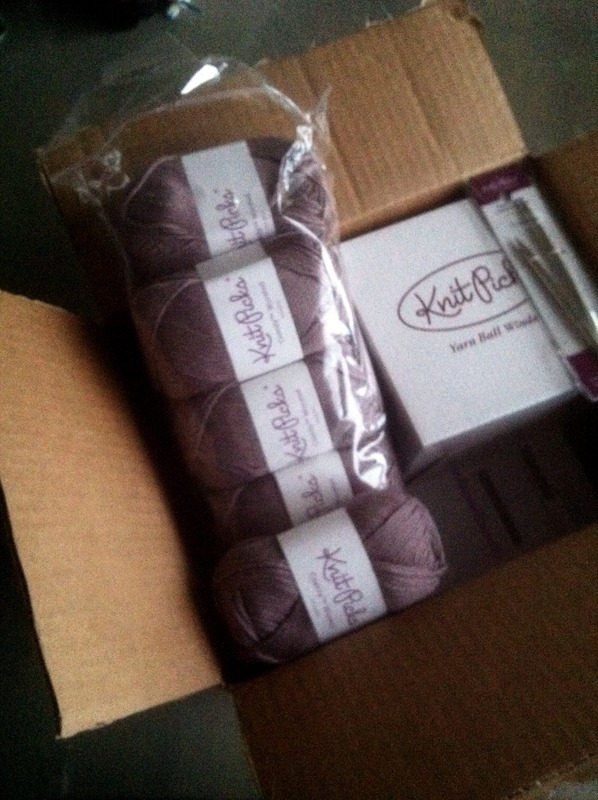 Last week I put in an order with KnitPicks for some yarn for my mom’s shawl, size 10 circ tips, and a ball winder. Opening the box, even though I knew all that would be in there, was like having an early Christmas or birthday. If I’m honest, I was actually kind of surprised at how small the box was until I opened it. The yarn is Comfy Worsted in Seraphim. Each skein is about 109 (ish? I may not be remembering correctly) yards, which is teeny tiny! I usually use cheap acrylic yarn, so the size difference threw me off. I guess it’s good I got 10 skeins then, huh? The real thing I got excited about, though, was the ball winder. I immediately pulled it out of its box and assembled it. This is a very strange contraption, I must say. I set up the yarn like it suggested and continued to completely mess up my first attempt. Luckily, I used some of that good-old cheap acrylic on the first go instead of the good stuff. The second attempt fared a bit better, but it’s still not pretty. I have, though, now wound up the next hank of Malabrigo and am back to work on my shawl. I do need to figure out what the trick is to winding. Slow and steady seems to help, but as it gets bigger, my yarn starts to slip right off of side of the winder. I’m not really sure what to do, so I may search the Internet for some answers. If anyone has any suggestions or hints, please let me know! All that together means I knit 2 rows total yesterday, and the rest of my time was spent playing with my new knitting toys. I’m sure things will get back into full swing this evening. It’s sock night, and I’m way behind on my socks.